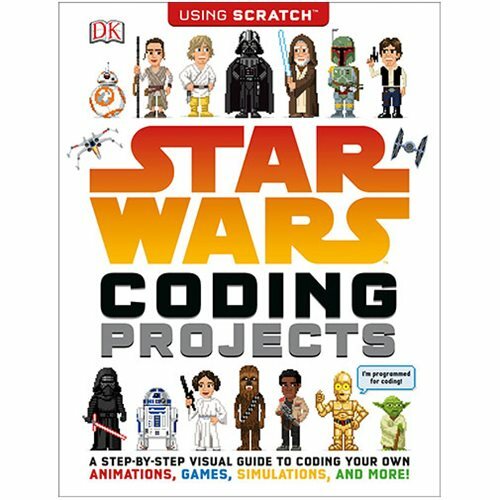 The Star Wars Coding Projects Paperback Book is a step-by-step visual guide to coding fun projects in Scratch and shows you everything you need to know to create cool computer projects, animations, and games. Create your own sprites and use them in your own projects. Build your own characters, navigate a spaceship through an asteroid belt, and go on a jetpack adventure. Learn essential coding skills, share your projects with friends, and challenge them to beat your scores. Each project consists of simple, numbered steps that are fully illustrated and easy to follow. Coding games have never been so easy or fun. The Star Wars Coding Projects Paperback Book has 96 pages. Measures about 11 1/10-inches tall x 8 1/2-inches wide.